Site Recorder 4 (SR4) is mapping, recording and finds handling software for maritime, freshwater and intertidal archaeology projects. 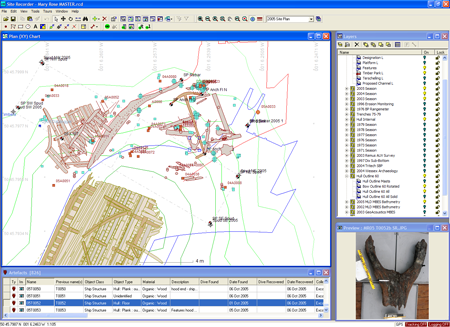 Combining versatility and flexibility with an easy to use style, this software is capable of integrating all of the information collected during a large scale excavation but is just as useful for small scale mapping and evaluation projects. Site Recorder 4 is a geographic information system (GIS), finds database, survey processing program, dive log and image management tool all rolled into one seamless program. Site Recorder 4 is powerful, practical and easy to use for real time data collection, decision support, publication, archiving and data migration. The program has been designed by archaeologists for archaeologists so you don’t need to be a computer expert to use it. Site Recorder 4 is the industry standard for underwater archaeological site recording and is in use by governments, universities, museums and companies in more than 23 countries across the world. Site Recorder 4 is shipped with a free PDF manual and a free self-paced Exercise Book so you can easily become familiar with the program. Academic discounts, upgrades from previous versions and volume discounts are available and for current prices please see the Ordering page. Learn Site Recorder for free! You can download Site Recorder 4 and run it without buying a license. The Demo program has enough capability to do all of the exercises in the Exercise Book, so you can learn to use SR4 for free! Site Recorder 4 has been designed and developed by Peter Holt with the help of archaeologists, conservators and surveyors on archaeological projects in more than 25 countries.